Litchfield National Park in Australia's Northern Territory is a true little gem. 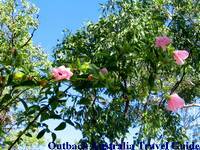 The small park had long been overshadowed by its huge and hugely popular, bigger neighbour, the Kakadu National Park. But Litchfield has many advantages: it is close to Darwin, it's small (at least by Outback standards...), and a bitumen road takes you to all its main attractions, which are a lot closer together than Kakadu's. That means you can easily visit Litchfield National Park on a day trip from Darwin, and you can spend most of the day exploring rather than driving. In the past Litchfield was only known to the locals from Darwin. In those days you had to get a permit to access the area, and you definitely needed a four wheel drive. But then you could go and set up camp right at the top of one of the many waterfalls and you had it all to yourself. Ah, those were the days... but I digress. Litchfield was made a national park only in 1986. No more permits are required and the roads and facilities are being improved all the time. Over the last years Litchfield has seen a surge in popularity. 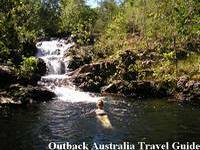 The result is that the solitude and the bush feeling has been lost, at least at the bigger attractions like Wangi and Florence Falls. On this page you can find out about how to get there, campgrounds, facilities, best time to visit etc. All you need to know to plan your trip. Here you can read about all the attractions and waterfalls. I tell you what to expect, what you can do, how much time to bring, and there are many pictures as well. It's the same in Litchfield as in other national parks. There are magnificent places where the tour buses don't bother stopping. Why? Because you'd have to do some walking to get there. There are also some fantastic overnight walking tracks, and then there's the 4WD only southern access track... On this page you can find out more. Been To Litchfield Or Plan On Going? Share your thoughts and experiences. Did Litchfield live up to your expectations? Exceed them. Maybe you have a great tip to share? Or a photo? A video? Of course we'd love to see them, too! You can also ask a question. See below the form what others have reported or asked about Litchfield NP. You can find more reader comments about Litchfield & Kakadu here. Enter the title of your Litchfield story or tip.